H. Avray Tipping, English Homes, Period VI, Late Georgian, 1760-1820, vol. I, London and New York, 1926, p. 233, pl. 369. Jacobs, Bertram: Axminster Carpets (Hand-made) 1755-1957, Leigh-on-Sea, 1970, pl.56. In 1755 Thomas Whitty established his carpet manufacturing workshop at Axminster in Devon. His success was almost immediate; Whitty's Axminster carpets were highly regarded by the Society of Arts and were awarded the Prize offered for carpet weaving in 1757 (shared with Thomas Moore of Moorfields), 1758 (shared with Peter Parisot of Exeter) and 1759 which he won outright. Leading architectural designers including Robert Adam and James Wyatt turned to Whitty to create some of their designs. Even the Prince of Wales became a patron, commissioning a number of carpets. The full achievement was acknowledged in 1783 with the royal visit of George III to the workshop. The magnificent carpet offered here was made for Sir Thomas Rumbold at Woodhall Park. Rumbold was a man who had gone to India in the service of the East India Company at the age of sixteen and had, after a relatively short, successful and extremely profitable career, retired back to England in 1780. He hired the architect Thomas Leverton to rebuild his recently acquired seat of Woodhall Park in Hertfordshire after the fire of 1774. Like Robert Adam, Leverton incorporated Classical Greek designs in his work; Woodhall is the most complete country-house expression of his style that remains to us (Tipping, H Avray, op.cit., p.224). His ornamentation, as seen particularly in the plasterwork of the house, is very delicate and derives ultimately from the Etruscan style, often worked in the "brown, red and yellow of 'Pompeian' tones" (pp.225-6). It is exactly these colours that characterise the present carpet. The design of the carpet alludes throughout to Classical mythology. The central medallion is formed by a sunflower derived from ornament on the Temple of Apollo at Palmyra which had been recently published in Robert Wood's enormously influential Ruins of the Temple at Palmyra of 1753. This shell-scalloped medallion is enclosed in a foliated ribbon-guilloche comprised of Bacchic vines and wheat that is sacred to Ceres. In the spandrels palms sacred to Apollo accompany Roman acanthus foliage. This central rectangular compartment and its end tablets, which are centred by lozenged compartments, recall the Temple of Venus in Rome. The structure of the design is one that would typically, following Robert Adam's lead, have mirrored the compartments in the plasterwork of the ceiling. Unfortunately, the ceilings in both the Drawing Room, which is where the carpet was displayed early this century, and the Dining Room were replaced in the early 19th century. The symbolism of the wheatsheaves interwoven with the fruiting vine around the central roundel however certainly indicate that the Dining Room was the original place for which it was intended. The intertwined continuous vegetation seen around the medallion is a feature of the best known of all Axminster designs of the eighteenth century; one which, judging from the number of surviving examples, must have been extremely popular. These include examples made for the Earl of Stradbroke at Heveningham Hall, Suffolk (Faraday, Cornelia Bateman: European and American Carpets and Rugs, revised edition, Woodbridge, 1990, Colour Plate XLV), one in the the Victoria and Albert Museum (Sherill, Sarah B.: Carpets and Rugs of Europe and America, New York, 1995, pl.222), one in the Metropolitan Museum of Art (Jacobs, Bertram: op.cit., pl.53) and one at Rockbeare Manor, Devon (Jacobs, Bertram: op.cit., pl.55). Jacobs states (p.43) that Leverton was the architect employed to work on the Drawing Room at Rockbeare, although Christopher Hussey notes that the architect there is unknown ('Rockbeare Manor, Devonshire', Country Life, May 3, 1930). Interestingly the end panels of the present carpet are identical to those of the Rockbeare Carpet. 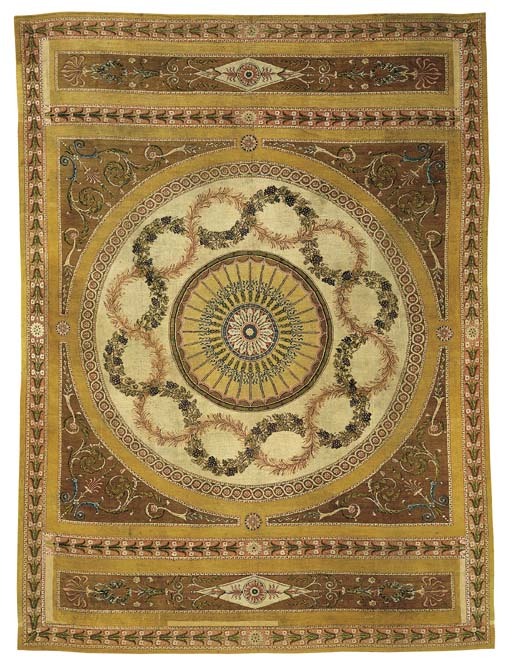 This, coupled with the similarity of the central medallion design could well indicate, as suggested by Jacobs, that Leverton was the designer of that most famous series of carpets. It could also indicate that, as seen in the preceding lot, Whitty was not at all averse to cribbing all or part of a design from a specific commission and including it in a new carpet. The design of the present carpet owes much to the carpet Robert Adam designed for Saltram House a couple of years before, in around 1775. Woven at Axminster, that has exactly the same design structure, combining a central roundel with narrow end-panels. Whitty, true to form, also wove a second version of that carpet, which is now in the Rijksmuseum, Amsterdam (Jacobs, Bertram: op.cit., pl.29).